Remarkable Mesa Restaurants and nearby eateries! Looking for remarkable Mesa restaurants and nearby? Where do you go for that special occasion with your best friends? Here are suggestions that are located around Mesa. Click on the restaurant pictures below to find out more. How about a pizza place that comes with a monster pipe organ billed as one of the largest in the world! Organ Stop Pizza is one of the most remarkable of all Mesa restaurants. Then there’s the restaurant that started out as a church in 1908! 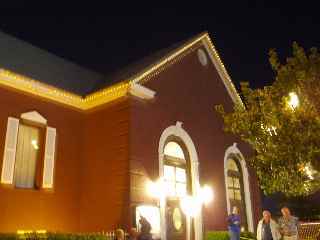 This vintage building has historical photos to view while you enjoy your food in one of the best historic restaurants. Unfortunately the Landmark has closed. See some pictures of a once great restaurant. 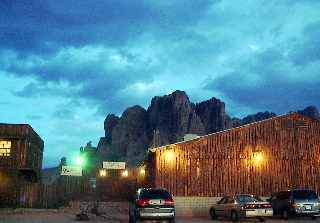 This wood cabin restaurant is located in the shadows of the mysterious Superstition Mountains just east of Mesa. Looks like a camp shanty out of the mining days. This place has family style eating and you better be hungry. It’s all you can eat. Guests sit on long wood tables like park benches and eat on tin plates and cups. The ambiance is rustic and the food is fit for a hungry miner. You will love the endless heaping stacks of smoked beef ribs. 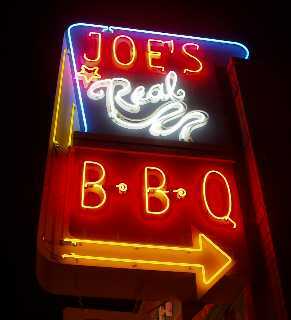 Joe's BBQ has been around for years and is an anchor of Gilbert downtown. Unbelievably good food and old farming decor. Hot dogs! 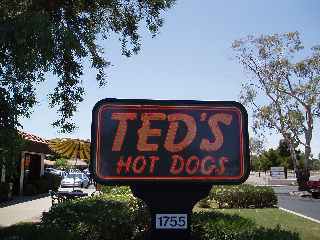 Just about the best hot dogs west of New York can be found at a place called Ted's Hot Dogs. Remarkable flavors with great prices. 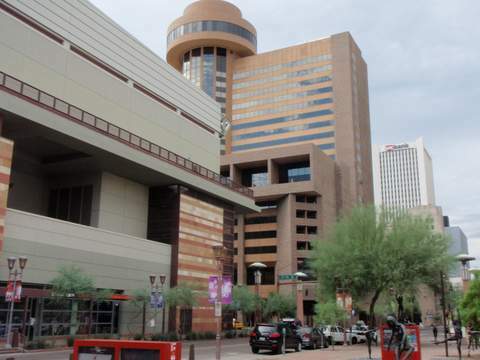 What restaurant has the only revolving floor in all of Arizona? This place offers a terrific view of downtown Phoenix and the sunsets are spectacular. Great for your new guests to Arizona. You can see all the way out past Mesa on a good day. Takes about an hour for you to see the whole 360 degree view. Click on the picture below to see pictures of the Compass Restaurant. What are other people saying about these restaurants? How do you find out about a remarkable place to eat? Most people listen to their friends. I have a friend that said his experience at a fine restaurant was so-so and was a little shocked because my experience was so good. So you have to wonder if this was a one time experience or did the quality go way down or up? One way you can check is look at what other people say. So check out the reviews that can be found on the map on the bottom of every restaurant review page.